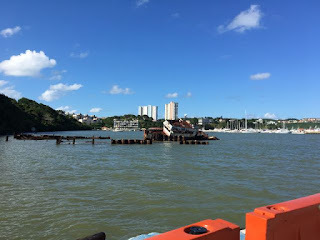 At 5:30 am, after 3 hours sleep, I decided to take her on the 6:30 am ferry to Fajardo. (The Captain stayed behind with the boat in case I missed the last ferry back). 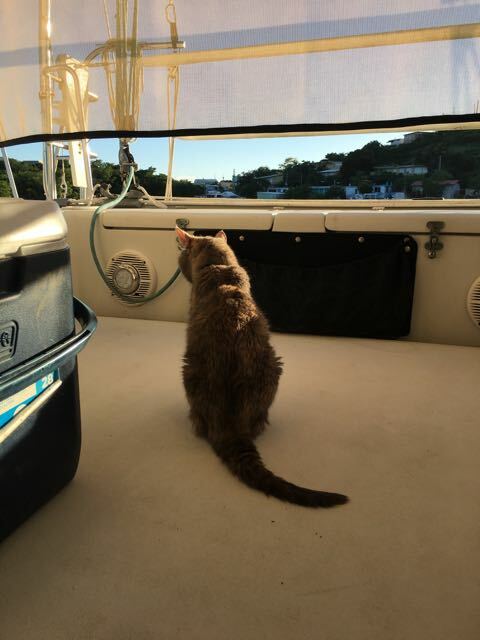 It was a 1 hr, 30 min ride and I was able to get two vet recommendations from my Women Who Sail FaceBook group including address/phone numbers/email before we docked! El Capitan wanted me to grab a taxi, but I spotted the Thrifty rental car van & hopped in behind another couple. "DO YOU HAVE ANY CARS?!" They gave a last minute walk-in their normal econo rate with directions & I was off. Luckily, I knew the area pretty well from our time at the marina and arrived at Dr. Delgado's by 9:00 am. They had received my email & were expecting us. He was AMAZING (and yes, spoke perfect English. Many pet & people Dr's get their education in the US but you never know)! In addition to our reason for coming, he officially diagnosed her arthritis (we'd been getting anti-inflammatory shots every 3 months after another emergency visit in Palm Beach, FL--the week before Thanksgiving and the week we were scheduled to leave for the Bahamas. It was a hail mary pass by another wonderful vet to alleviate her obvious pain & it worked). An x-ray showed two compressions & the beginning of spurs, so on top of continuing the shots, he recommended a supplement to help with the joints & a hairball/laxative. Mom's treat for her efforts. 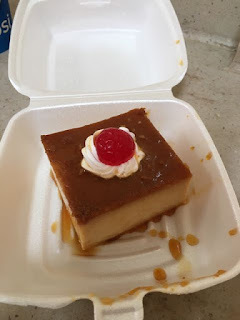 Flan! Yep, I took the ferry into Fajardo, rented a car & navigated. Alone! He asked if I had any errands I could do while he gave her an enema ("YES!!!") so I was off to breakfast (left without even having a cup of coffee or brushing my teeth! ), grocery store and WalMart. 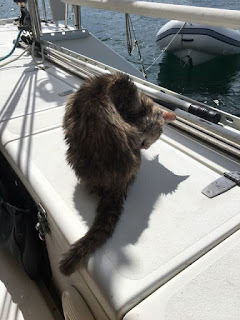 I returned after lunch & they were trying to coax her into her carrier so I could make the 3:00 ferry back to Culebra (the techs could not have been any gentler, although a little afraid of the hissing psycho she becomes at the vet, even though she only weighs 6 lbs & has no teeth!). 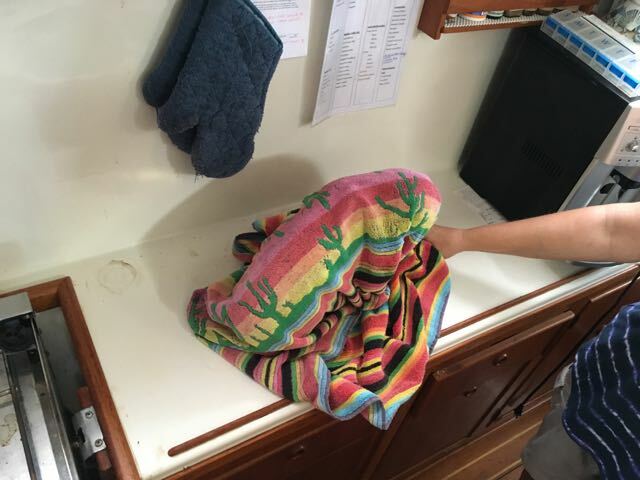 Not what you want to see as you board a boat. Upon arriving back at the boat, she wasn't speaking to either of us & didn't want to be touched. (Feeling violated, I'm sure!). She went for a walk around the cockpit, then in for food & water, then curled up in the cubby behind her food bowl & went to sleep. I was greeted the next morning by a loving & HUNGRY little girl. 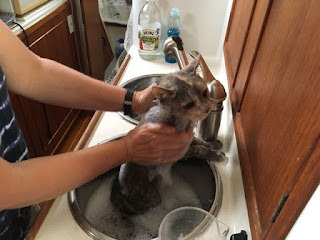 I spoiled that by giving her a bath (Yes, we bath our cat. No, it's not easy but I grew up in a house with show Persians so I'm a pro--fast & efficient but we did stop for pics...Yes, we used precious fresh water to bath a cat!). Saying "Thank you. I feel better." to Mama the next morning. "You've got 2 minutes and I'm outta here..."
"Ohey. What a mess she made!" AGAIN: I shared this before & I'll share it again. 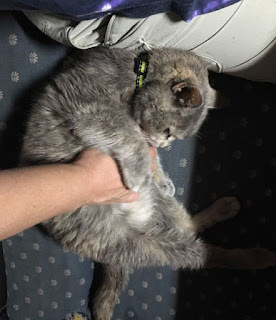 Our cat is almost 20. Friends in Brunswick also had an old cat & their vet demanded NO DRY FOOD which is also what Dr. Delgado demanded. She was getting both but especially in older cats, it can cause dehydration. NO DRY FOOD! A special thank you to all of our cruiser friends who recommended a vet then messaged via FB all day to check on her progress. I appreciated all your kind words! It was a long day.